Nestled above a private cove beach (locally called a keyhole) on the South shore of the tropical island of Roatan, l'Alize enjoys both a constant sea breeze and a dramatic view of the Caribbean every day of the year. L'Alize derives its name from the French word for African trade winds, (alizes) which flow East to West during the warmest months of the year. These dramatic winds account for a such a surprising cooling effect on the hottest days, that it quickly becomes clear why Roatan's earliest towns settled on the South side of the island where these winds rarely fail to cool and refresh while they keep the bugs in check. L'Alize was built by one of Roatan's premier builders in 2009. The building techniques and materials reflect attention to detail and quality construction. Keen usage of space, and maximization of views and sea breezes, remind one that this exquisite home was built to be enjoyed year round by the builder himself. In 2011 a major renovation added the pool, deck, cottage, two bedrooms and two baths. In 2014, L'Alize was awarded the distinction of a luxury destination for Homeaway's Luxury Rentals site, by Andrew Harper, a leading luxury travel company TM. 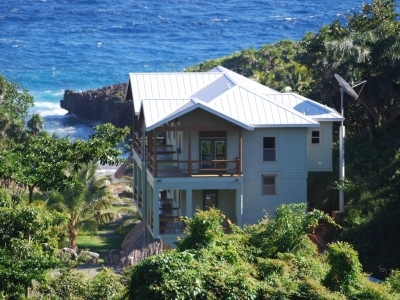 Only two of Roatan's vacation rental properties have qualified for this prestigious rating (see luxury.homeaway.com). L'Alize is spaciously laid out to maximize the 3 500 square feet, with a large master bedroom and master bath complete with double shower. There are additionally 2 500 square foot balconies and decks. The third floor guest room enjoys a spectacular view with a large private deck and spacious bath. The second floor great room opens to a large deck, The kitchen, living and dining room occupying the entire second level. The breathtaking view invites you to sit and take it all in. An ample half bath is conveniently located on this level. Air conditioning is a recent addition to the dining/living area for those rare days when the winds die down. The first floor addition has its own kitchen, two bedrooms, two baths and a living area which, overlooks an equally stunning view of the pool, patio and the Caribbean. High speed internet now reaches this area as well. Recently upgraded the internet provides five MB per second download speed. Wireless internet works on all three floors. This first level living room has speakers that can connect to an iPhone. This room opens to the pool area. The house is rented as a four bedroom home but, we offer discounts to parties of four or less. The guest cottage can be added to offer more space for larger parties. Eddie our capable groundskeeper will tend the pool and rake the beach each day and assist you as needed, even pick up your carry out. Olga, his wife, will competently provide daily housekeeping (please let her know when you would like her to come) and even prepare typical Honduran meals (on request), so everyone can relax a little more. Quick list of our most popular amenities. photos with friends and family while you compare your day's adventures. Guest House: The guesthouse is a separate building located on the North side of the home. This perfect little cottage has a double bed with travertine floors, granite counters and a private bath. It does not have air-conditioning . The guesthouse can be rented additionally for $250/wk. It is not rented alone. A vehicle is available for our guests' use throughout their stay as available. Please ask for details. L'Alize only gets more stunning as you leave the home to explore the iron-shore. From mangroves to volcanic iron-shore and ancient coral, this nature walk is worth the effort. Mangrove canopy tunnels and the pristine keyholes will delight visitors as they wind their way on the nature trail leading to Pirates Cove. Of all the features that make this home a sanctuary from the pressures of busy lives, the one that soothes the soul best, is the unspoiled habitat surrounding l'Alize. L'Alize has two kayaks with which guests can visits areas few eyes have seen as these silent crafts make their way past the uninhabited iron shore. Whether seeking sanctuary from a pressure filled life or celebrating the beginning of a new life with your special someone, l'Alize offers adventure or relaxation, luxury and privacy, unspoiled nature and plenty of nearby activities to suit all tastes. L'Alize nestled in a tropical haven. Private beach at first cove. View of Honduras from porch. North Shore Beach, 15 minute walk. First level guest bedroom 4. First level guest bedroom 3. Caught off the iron shore with a line. Master Bedroom 1 King	 2 En suite bathroom. Third Level Guest Bedroom 2 Single/Twin	 2 Twin beds convert to king bed. En suite bathroom. First Level Guest Bedroom 1 1 Queen	 2 En suite bathroom. First Level Guest Bedroom 2 1 Queen	 2 En suite bathroom. Cottage Bedroom 1 Double	 2 En suite bathroom. Two folding beds, which can be added to any room, are available upon request. Master Bathroom full Toilet, Shower	 Double shower and sink. Cottage rental is an additional $250 per week. Additional guests (eight or more) is $100 per week per person. Electricity is charged at $0.48/kWh. L'Alize is located on the South shore of West End. Close to all beach activities, rentals or scuba lessons but still very quiet and private. Because of the steep slope to the home, we recommend a rental vehicle (we have one available to rent for $150/wk). Taxi's or tour bus operators are a call away. Roatan International Airport at 10 miles. Roatan Ferry at 12 miles. West Bay Beach at 2 miles. Black Pearl at 15 miles. West Bay Road at 0.5 miles. Argentinian Grill on West Bay Beach at 2 miles. West Bay Beach or Private Keyhole Beach at 50 metres. Located on the south shore of West Bay, l'Alize sits perched above a pristine Cove beach, with wildlife and tropical vegetation surrounding the home. Guests can visit West Bay Beach, (a three minute drive or 15 minute walk) to enjoy restaurants, a nature park, rent scuba equipment or even risk para-sailing. Enjoy relaxing on the pristine white sand beaches or check out the snorkel gear from l'Alize and see what beauty lies beneath the turquoise waters. Relaxing in the salt water pool is the perfect way to relax and reflect on your perfect day. Two tandem Kayaks are now available to guests. Each can seat three average sized adults. These gliding boats will allow guests to see the dramatic beauty of the uninhabited iron shore and explore caves and snorkel new areas. If you would like to use these please ask at check-in.